The background, that is. I’m pretty much winging it with various filler stitches in randomly-drawn blocks. The plan, such as it is, is for the foreground to proceed more or less in rainbow order left to right, and the background to reverse it. So while I’m starting with blues and greens in the lower left, and planning to end with red-purples in the lower right, the upper left will have red-purples and go through some variation on ROYGBIV to blue-greens in the upper right. It makes sense in my head, anyway. My palette here is determined by the scraps of wool that I have, which are left over from other projects. I’m introducing elements of cotton floss as well to expand my color range to better fit the range I want. I may end up going to the store to supplement my wool, but I’m trying to avoid that. This is supposed to be a stash buster, not a stash expander. The border of the image is Noro Silk Garden couched with tapestry wool. I had some left from a long-stalled knitting project, and this seemed like a good way to use some of it. 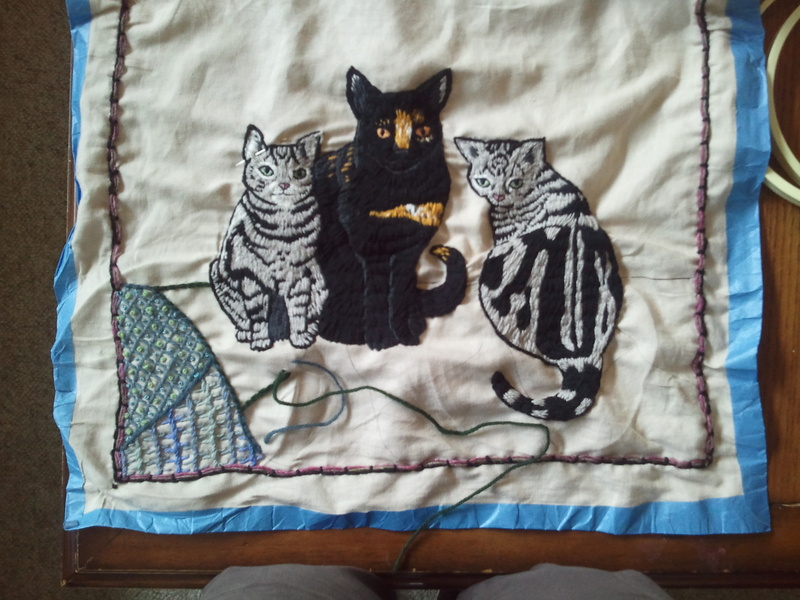 This entry was posted in Uncategorized and tagged blue, cats, embroidery, surface embroidery, wool by Rene. Bookmark the permalink. Ooh, such fun! I’ll take any excuse to use new or rarely done stitches. I like the colours, I think they work well.